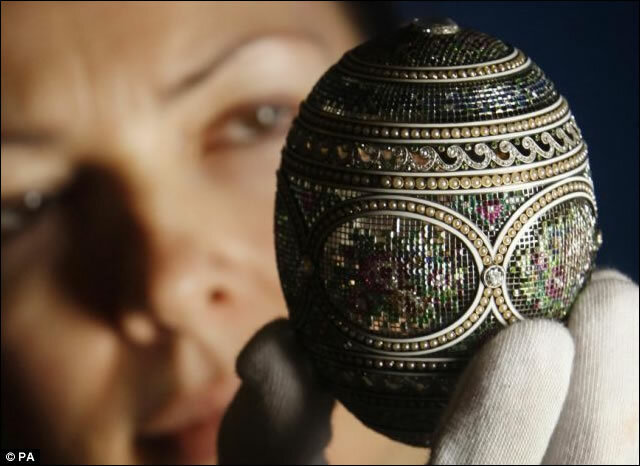 The 1914 Mosaic Egg is made of yellow gold, platinum, brilliant diamonds, rose-cut diamonds, rubies, emeralds, topazes, sapphires, garnet, half-pearls, moonstone, white enamel and opaque pink enamel. 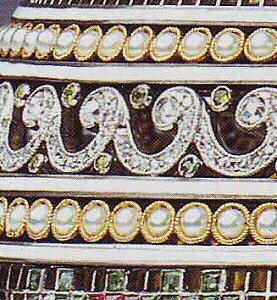 The pedestal surprise is made of gold, pearls, rose-cut diamonds, green garnets, translucent green, opaque white, opalescent pale pink, pale green and pale sepia grisaille enamel. This beautiful Easter Egg consists of a system of yellow gold belts, to which is applied a platinum network partially pavé-set with diamonds and colored gems, including sapphires, rubies, emeralds, topaz quartz and green garnets in flower patterns. This technique gives the look of petit point tapestry work, partly completed. It is divided into five oval panels set with half-pearls within lines of opaque white enamel. Five brilliant diamonds are set at each intersection. 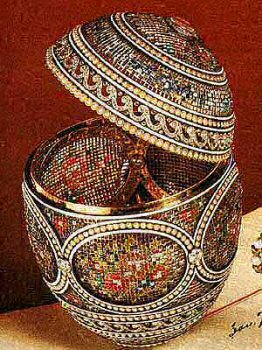 The Egg is further decorated by grilles of rose-cut diamond scrolls and the rounder end is set with a moonstone through which may be seen the gold initials of the tsarina in russian characters, inlaid in an opaque, pale pink enameled plaque serving as a foil. The surprise concealed inside and held in place by two gold clips, consists of a jeweled and enameled miniature frame painted with the profiles of the five Imperial children, surmounted by an Imperial crown set with rose diamonds. The reverse is enameled with a pale sepia basket of flowers around which the year 1914 and the names of the five children.The oval base with vase-shaped white enamel stem is set with rose-cut diamonds, emeralds, and two suspended pearls. 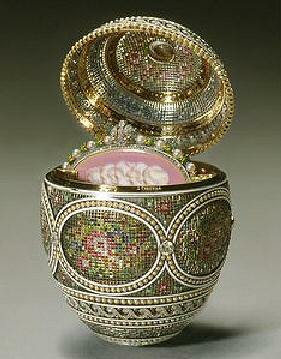 The Egg is engraved with Fabergé's name in Cyrillic characters. We now know that Alma Theresia Pihl, who was responsible for the 1913 Winter Egg, also designed the tapestry flower detail for the Mosaic Egg. The design is derived from a watercolor rendering dated July 24, 1913, in the record books. It depicts a circular brooch set with colored stones in a floral pattern, the effect of which is usually described as "mosaic," giving the egg its name. It is clean, however, that the surface the Easter egg was inspired by needlepoint. An artist who drew on the world around her, Pihl almost certainly took her design from the needlework fire screens that were found in every genteel sitting room at the time. A provocative combination of feminine domesticity and artistic daring, the Mosaic Egg epitomizes the originality of Pihl's work. Unfortunately, her career as a designer was cut short by the Russian Revolution of 1917. The Faberge firm was shuttered by the new regime, and its artists scattered in exile. Pihl escaped to Finland, where she lived until her death in 1976, recounting to a younger generation her stories of the lost world of the last great court jeweler. In some ways, the Fabergé story of the Tsar Imperial Easter Eggs ends here. Within months, the cataclysm of World Ware I would begin, and with it would end the era of privilege and luxury so exactly reflected in Fabergé's master works. 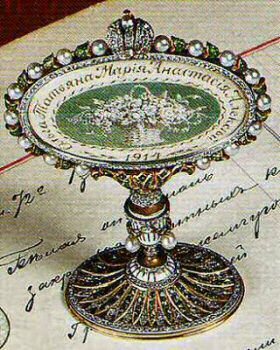 The firm would continue to produce Imperial Easter gifts for two more years, but the cost of the war would mean grim austerity for Russia, the Tsar and Fabergé. This was the last Easter Egg made without the constraints of a menacing outside world. It seems appropriate that it should be something as beautiful and original as the Mosaic Egg. In 1933 the Mosaic Egg was sold by the Antikvariat to an unrecorded buyer. 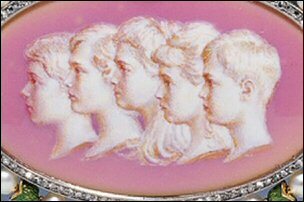 1934 Sold by Cameo corner, London, to King George V and Queen Mary. 1953 inherited by Queen Elizabeth II. Remarkable private pictures of the Russian royal family found in a remote Urals museum include close to a hundred photographs of the Russian royal family, many taken by the Tsar himself or his children. 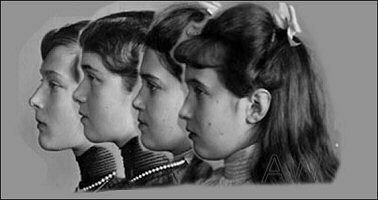 Among those photographs is a series of four photos of the four Grand Duchesses, daughters of Emperor Nicholas II. A composition of the four photos shows that most probably these photos were used by the firm of Fabergé to create the surprise of the 1914 Imperial Easter Egg, the Mosaic Egg now in the Royal Collection. 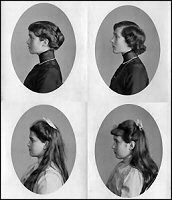 If you compare above composition with the below row of imperial children, it is clear that whilst the heir is missing in the photographs, the girls look exactly as in their photos. 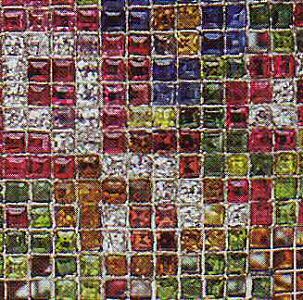 The idea for the surprise of the 1914 Mosaic Egg perhaps has an illustrious predecessor. It was known that Empress Maria Feodorovna, wife of Paul I, was a gifted artist in her own right whose talents included an ability to carve cameos, turn ivory and amber, draw, paint and engrave medals and buttons, some of which she presented to her mother in law Catherine II (Catherine the Great). Source: Sotheby's. 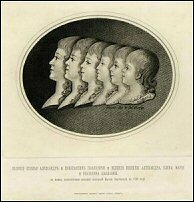 Above a drawing of six of the Children of Paul I (1754-1801) and his second wife Maria Feodorovna (1759-1828), born Sophie Dorothea of Württemberg, the drawing by the Empress herself. 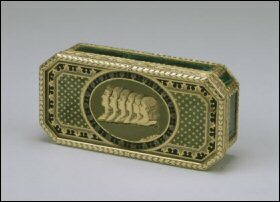 On the right a cigarette box (reversed), now in possession of the Walters Art Museum. Remarkable detail is that the box was sold to Henri Waters by Alexandre Polovtsov in Paris in 1928 or 1929. Around the same time Mr. 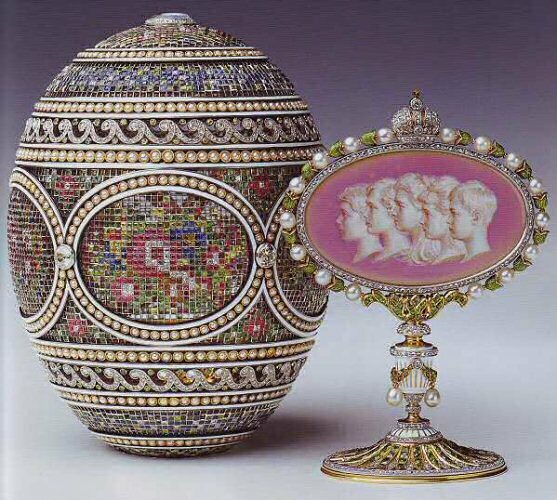 Waters acquired Fabergé's Imperial 1901 Gatchina Palace and the 1907 Rose Trellis Eggs. How the two Imperial Eggs passed from the Imperial family to Mr. Polovtsov remains to this day a mystery. Source.